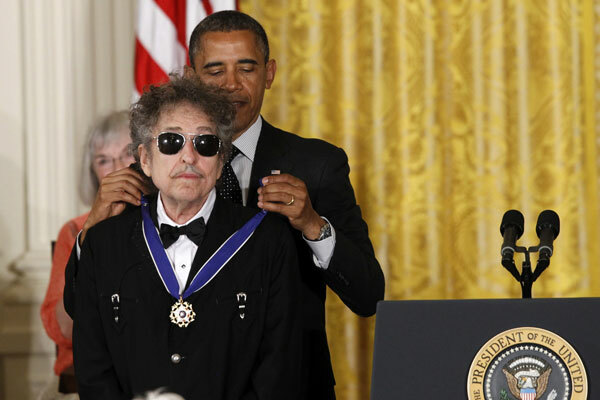 US-President Barack Obama presented the "Presidential Medal of Freedom", the nation's highest civilian award, to Bob Dylan among other political and cultural greats. Obama spoke of how the recipients were his "heroes individually", and about how they all "marked (his) life in profound ways." Looking back on his college days, the President remembered listening to Bob Dylan, "he captured something about this country that was so vital." And later, he added: "I understand that the impact that these people have had extends beyond me. It will continue for generations to come." The Medal of Freedom recognizes individuals who have made "an especially meritorious contribution to the security or national interests of the United States, world peace, cultural or other significant public or private endeavors". It was established in 1963, the year when Dylan's landmark album "The Freewheelin' Bob Dylan" was released.